Puchong, 7 Nov: When even Khairuddin Hassan came out to slam Najib Razak's "kepala bapak kau/bodoh" outburst, it shows how effective the Prime Minister is in reaching out even to those deemed as far beyond redemption. 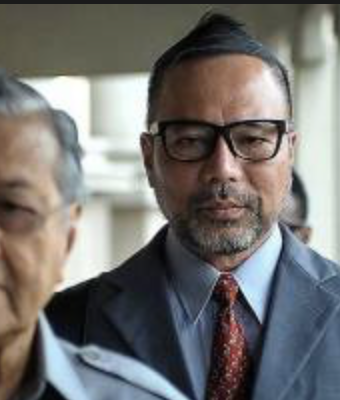 For Khairuddin is, to many followers of Malaysian politics, the quintessential Mr Bangang. No, not because he is stupid but because he is so fond of calling everyone and anyone who disagrees with him or his politics bangang (which is another of the great many Malay words, such as bodoh, bebal, baghal, bingai, to describe stupid). This is the same man who published* the "50 Dalil ..." book 20 years ago, which was used by the powers that be then to sack and jail his Deputy, but who today hails the still-imprisoned Anwar Ibrahim as a hero! As for Najib's outburst, I agree with Salahuddin Hisham the blogger. Make no apologies. Najib should start calling a spade a spade. Even the young ones at our office, who had always thought of their Prime Minister as so sanitised and sometimes robotic, especially when delivering his speeches in Malay, were excited. They were having a ball playing the same video clip of the kepala bapak kau outburst over and over again. The PM's human, after all! I must admit this "new" Najib is a great and welcomed departure from the usual guarded, immaculately-scripted, boring manner in which he's come to be know when delivering his BM speeches at official functions and Umno gatherings. Just don't call anyone bangang lah, Mr PM. Mengamok Khairuddin kita nanti! Fully agree with every word. Takut you tak dapat enough 'positive comments', so I tolong sikit lah ^^^^^^. "Najib is a great and welcomed departure from the usual guarded, immaculately-scripted, boring manner in which he's come to be know when delivering his BM speeches at official functions and Umno gatherings." Hmmmmmmm, which Najib have you been watching, Latuk? The man screeches and wails and over-dramatizes everything. Do watch some past PAU videos on YouTube. Bloody idiot MO1 - Trying to be like his late father ... jauh panggang dari apilah ... kepala segala penyamun ya! Latuk, it is shocking you can also made comparison between Khairuddin and Najib. Who is Khairuddin ? did he hold any position in the Government ? Shame on you la Latuk err where is you "latukship" come from ? Cukup2 lah nak tunjok u buat kerja support Najib to earn your dedak.